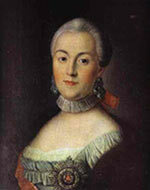 With the ascent to throne of Tsarina Catherine II (1762), the Russian foreign policy experienced a fundamental change. Catherine continued the modernization course of her predecessors. Her objective was to break the power of the Ottoman Empire in the Balkans. The straits and Constantinople should be fall under the Russian control. A series of wars against the Ottoman Empire brought this aim closer. Large part of southern Russia and southern Ukraine came under the Russian Empire. In the new land, summarized under the name New Russia, were founded numerous new towns like Sevastopol, Odessa or Jekaterinoslaw. The Russian empire was able to defeat in several campaigns the Ottoman Empire. With the Treaties of Küçük Kaynarca (1774) and Jassy (1792) Russia guaranteed the entire north coast of the Black Sea till the River Dniester. The Crimean Khanate was given its independence, but in 1783 it was annexed to Russia. Even during these campaigns began the settlement of Greeks, Albanians, Armenians and Slavs.